The company will get $500,000 per year in state income tax refunds, as long as it keeps at least 1,069 manufacturing jobs in the state. It will also get about $200,000 a year to retrain workers, funding which is generally provided by the state. 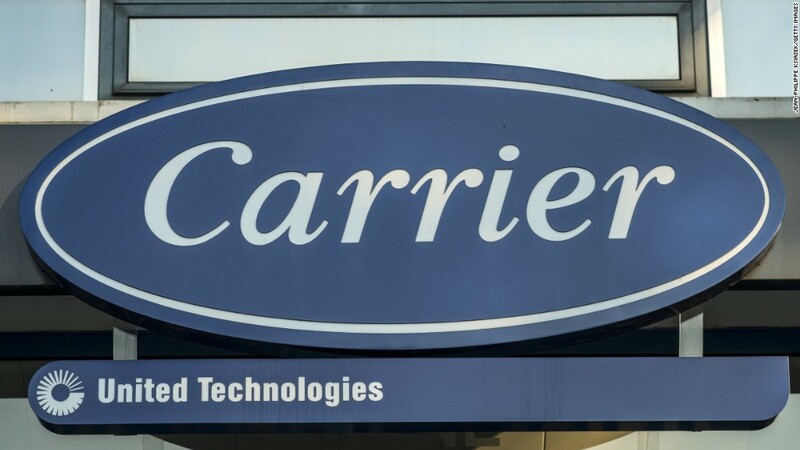 Carrier actually had to return some retraining funds to the state when it announced plans to move to Mexico earlier this year, and this deal reinstates that money. Even though this package of incentives isn't a lot of money, the practice is worrisome from a policy perspective, Jensen said. "It's clearly a small deal. But you have a business that made a threat getting $7 million it doesn't need," Jensen said, "while there are small businesses paying the full tax rate." He added that "there's the concern that this only encourages more companies to make this kind of threat to move, if not to Mexico then to another state." It's not yet clear how much of the company's decision was based on concerns about maintaining the significant amount of business it does with the government. Carrier parent United Technologies (UTX) is a major defense contractor, with $5.6 billion in revenue from federal government contracts, or 10% of its total revenue. The government also pays for $1.5 billion of its research and development costs. Whatever the reason for the change of heart, members of the Trump team were thrilled with the credit he is getting for saving the Carrier jobs. "The President-elect and the Vice President(-elect) picked up the phone and called the CEO of United Technologies and told them we want to keep jobs here. Can't remember the last time a president did that," Steven Mnuchin, Trump's pick to be Treasury secretary, told reporters in the Trump Tower lobby Wednesday. The deal is being criticized by officials on both the right and the left. Sen. Bernie Sanders wrote in the Washington Post that U.S. workers' jobs are less secure because of the deal, since companies can simply threaten to move to Mexico in order to get tax breaks from the government. "In essence, United Technologies took Trump hostage and won. And that should send a shock wave of fear through all workers across the country," Sanders wrote Thursday. Even some conservatives said they didn't like the idea of an incoming administration getting this involved in negotiations to save one company, especially one with such a minimal impact on the overall economy. They say it smacks of government interference in the marketplace, which they think is a bad idea. "It makes sense for a president and his team to change a tax code, change the regulatory environment to help businesses," Douglas Holtz-Eakin, president of the American Action Forum, a conservative Washington think tank, told CNN. "I'm not a big fan of this kind of negotiation. I think the more limited it is the better."